Lot 1068 U.S.A. #4 1875 10c black Washington Imperforate “Reproduction”, unused (no gum, as issued) with intense shade and a crisp impression. Large margins all around, with trivial paper thinning at top (mostly in margin), else a very fine and attractive stamp. 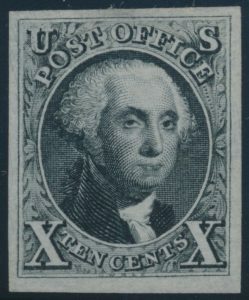 Scott CV U$1,050, sold for $625 plus buyer’s premium.